Jimmy Nicholl was born on 28 February 1956 in Ontario, Canada. 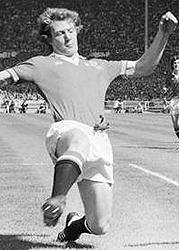 He joined Manchester United in 1971 as a teenager as a defender. Tommy Docherty was the United manager at the time. Jimmy Nicholl made his Manchester United debut on 5 April 1975 against Southampton. He came on as a substitute at the Dell in a Division Two match that United won 0-1 via a Lou Macari goal. It was nineteen year old McCreery's only appearance in the 1974/75 season. By the 1976/77 season Jimmy Nicholl was the established right back at Manchester United and he also scored his first, of just six, goal for the Reds. Nicholl scored the second of seven goals that United scored against Newcastle United in the fourth round of the League Cup in October 1976. Nicholl scored his last goal for Manchester United on 21 March 1981 against Ipswich Town in a 2-1 win at Old Trafford. Welshman Mickey Thomas scored the other United goal. Jimmy Nicholl played 248 times for Manchester United in a playing career that lasted six and a half years. The one major honour that he won during his time at Old Trafford was an FA Cup winners medal in 1977. Nicholl was one of three Northern Irishmen that played in the United team that beat Liverpool FC 2-1 in that final. The other two were Sammy McIlroy and substitute David McCreery. In 1979 he also played in one of the most dramatic FA Cup finals ever. Unfortunately he was on the losing side as Arsenal scored as last ditch winner against United. Amazingly Jimmy Nicholl was one of eight Irishmen to play in the final that day. Jimmy Nicholl played his last match for Manchester United on 21 November 1981 against Tottenham Hotspur. It was his only appearance that season and ultimately the new United manager Ron Atkinson sold McCreery for £250,000 to Canadian club Toronto Blizzard in April 1982. Jimmy Nicholl made his international debut for Northern Ireland on 24 March 1976 against Israel in a friendly match. He went on to make 673 appearances for his country, just one as substitute, and one goal scored. Remarkably for such a small nation Northern Ireland appeared in two consecutive World Cup finals in 1982 and 1986, and Jimmy Nicholl played in every match at both World Cups. The highlight for Nicholl was when he helped the Irish to defeat the host nation, Spain, in the 1982 World Cup. Jimmy Nicholl played his last match for Northern Ireland on 12 June 1986 against Brazil in the 1986 World Cup in Mexico.